Anti-science sentiments rise to the top periodically whether it be from anti-vaxxers, climate-change deniers, or adherents of intelligent design. I am a strongly pro-science person and a fan of science fiction which at its basis should understand science and then speculate from that strong understanding. At times, it's nice to dig into a nonfiction book for a fresh perspective. Personally, I've been a fan of the writings of Stephen Jay Gould, which brings me to this book--the most recent by Niles Eldredge who co-wrote with Gould a controversial essay early in their careers promoting the idea of punctuated equilibria. Essentially, evolution is happening, but not at the constant deeply gradual pace that has often been conjectured. Rather, it usually happens in concentrated bursts by micro-populations that have become isolated from the core range and population of a given species. This book is largely making the same argument forty years later, while needlessly defending itself from accusations of being anti-Darwinian. 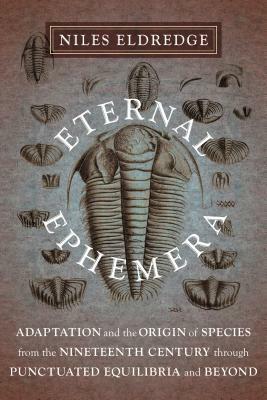 This book succeeds its mission to trace the competing hypotheses of evolution from the early Nineteenth Century with the writings of Frenchman Jean-Baptiste Lamarck and Italian Giambattista Brocchi through Charles Darwin up to the Twenty-First Century. It does not allows any past evolution-theorist to be summed up in a pithy one-sentence overview, which for historical accuracy purposes is a good thing. The various essays, letters and notebooks are analyzed by line through the development of hypotheses--two hundreds years of academia outlined. As a work of synthesis and scholarly archive, the book is thorough. What it isn't is populist. It is not trying to be interesting to those outside the sciences as the writings of Gould are. Most of the case studies that led to various insights have been stripped away. The tiniest of differences between ideas are quibbled repeatedly. What I enjoyed most in this book was seeing how early some ideas were being discussed. Easily a hundred years before plate tectonics and land-bridges were being conjectured came a quote within the context of an argument on species differentiation: "in those high northern latitudes, where the continents were undoubtedly at one time conjoined" [Jameson 1826]. Gems like this and watching the separate fields of geology, biology and paleontology converge in their world-view managed to keep me trudging through this book. I received a free copy from NetGalley for reviewing purposes. Sign into Goodreads to see if any of your friends have read Eternal Ephemera.